He got their second house, an investment property she had bought in Costa Rica, and a $96,000 annual alimony payment. "It's so obscene," said Holly Chiancola, 52, a Gloucester, Mass. real estate agent who is fighting the terms of a divorce settlement ordered by a judge in 2006. Chiancola's ex, who declined to comment for this story, is among them. Thanks in part to the pre-financial crisis real estate boom, Chiancola earned considerably more than her ex-husband, a sometime carpenter and fashion model, during their 19-year-marriage. She said her ex didn't hesitate to take advantage of that -- even though her income plummeted after the real estate boom years, and she's now struggling to make her mortgage payments. Chiancola said she partly blames Massachusetts' "outdated" divorce laws for her predicament -- she is a supporter of the group Mass Alimony Reform -- but she's also plenty outraged at her husband. "He went for the jugular, believe me," she said. Aggressive pursuit of spousal support by men is becoming more common, some divorce lawyers say, as the stigma of asking for alimony fades. "Early on, men were somewhat embarrassed to ask for alimony because it went across their defined roles in the culture. That has diminished," said Marlene Moses, the president-elect of the American Academy of Matrimonial Lawyers, an organization of family law attorneys. "There's been a revolution of men and their rights and the vigor with which they pursue legal opportunities for themselves." It's a revolution, experts say, that has been going on for more than 20 years -- actress Joan Collins' divorce and alimony case made headlines in the 1980s -- but today, it's still catching some women off guard. Take Terry, a 56-year-old Florida healthcare executive, who asked to have her last name witheld because her divorce from her husband is not yet settled. "He's a very independent man, a very macho guy, and I was quite surprised that he would ask for alimony," said Terry. Terry said her soon-to-be ex is asking for $2,500 per month in alimomy -- and she's fighting it. Terry, who earns more than $100,000 a year, said she's not against the principle of women paying alimony to their former spouses. But in her case, she said, it's not warranted. Her husband was laid off from an $85,000 per year job several months ago, but "he's completely capable of earning a living." For some men, just as with some women, it's past experience, not future earning potential, that weighs heavily on their decisions to seek alimony. One divorced New England man told ABCNews.com that he deserved tens of thousands in alimony payments because he played a key role in his ex-wife's professional success. "I helped her out in the background," said the man, who asked that his name be withheld due to ongoing divorce proceedings. Without him, he said, "there's absolutely no way she could have done what she did." Despite the increases in men seeking and receiving alimony, advocates warn against linking the trend to equality in the courtroom. Family court judges still tend to favor women, said Ned Holstein, the founder of Fathers & Families, a group advocating family court reform. "Family court still gives custody overwhelmingly to mothers, child support overwhelmingly to mothers, and courts still give almony overwhelmingly to mothers and women," he said. "The family courts came into existence years ago in order to give things to mothers that mothers needed," he said. "The times have changed and the courts have not." 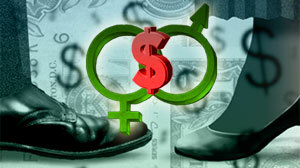 Recession Brings More Male Alimony? Today's economy may be adding new men to ranks of alimony-seekers. As traditionally male-dominated industries like finance and construction continue to struggle, more men are finding themselves with lower income or no income at all, forcing a newfound dependence on their wives or, in some cases, ex-wives. Earlier this year, a British judge ruled that Elena Bowes Marano should pay her ex, real estate tycoon Peter Marano, 5 million pounds (about $8 million) after his property portfolio dwindled in value -- an order that Elena, originally from a wealthy California family, is fighting. Such cases notwithstanding, a reversal of traditional gender roles in a divorce doesn't necessarily create more acrimony, experts say. Alexis Martin Neely, a prominent California family lawyer, is an alimony-paying woman content with her divorce settlement. Supporting her husband, she has said, allows him to spend time with their children. "I do really like him being available for the kids and their school events and if he can't work and do that, I'd rather support him to be readily available for them," she wrote in a blog post. "He deserves it and so do they."